Roll out the crescent roll sheet and cut into half. Then cut each half into 6 long strips. Sprinkle the cinnamon sugar onto a plate. Have the melted butter ready to go. Using a pastry brush or just your finger (that’s what I did) brush butter onto both sides of the dough strip. Dip the butter covered strip into the cinnamon sugar plate. Using your hands coat the strip on both sides with the cinnamon sugar. Twist the strip a few times and place onto a baking pan that has been sprayed with baking spray. Bake at 350°F for 12-14 minutes or until golden brown. It’s a little hard to tell with the cinnamon sugar on their but if you look closely you can tell. Once baked remove from oven and let cool for about 10 minutes. Add as much or as little icing as you would like to your twist. While the frosting is still wet add raisins or dried cherries if you would like. Feel free to leave them off if you prefer. I’m always looking for a new quick bread or Danish to add to my brunch and breakfast menus and these are a fantastic addition. Not only are they seriously simple, but they are crazy addictive. My family loves crescent rolls so it was no surprise that when it came down to the last Cinnamon Crescent Breadstick on the plate we almost had to arm wrestle for it. To make the Cinnamon Crescent Breadsticks, first gather the ingredients. You can use either dried cherries or raisins. We prefer cherries in my household. Using a pastry brush or just your finger (that’s what I did) and brush butter onto both sides of the dough strip. Bake at 350F degrees for 12-14 minutes or until golden brown. Then remove from oven and let cool for about 10 minutes. Add as much or as little icing as you would like to your breadsticks. While the frosting is still wet add raisins or dried cherries. Feel free to leave them off if you prefer. The breadsticks will still taste great! 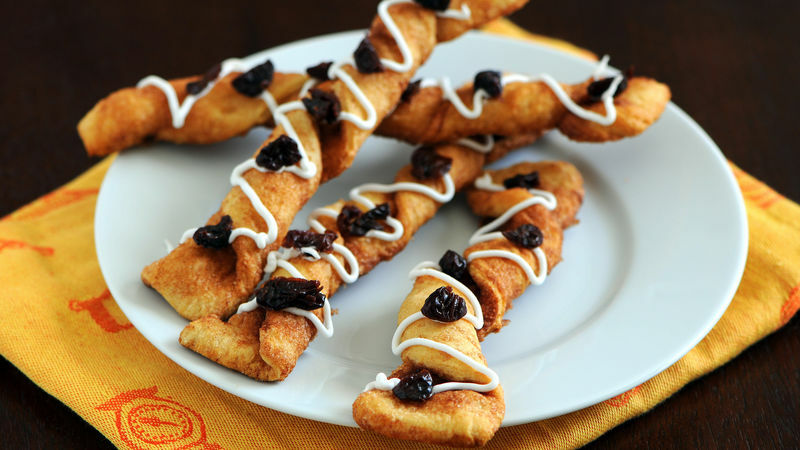 Enjoy these very addictive breakfast treats!